The basic unit consists of spindles. It can be jointed together to obtain 8 spindles. Each unit of 4 spindles and 8 spindles driven individually. Each unit of 4 spindles driven individually by ½ HP electrical motor connected to a counter shaft mounted underneath the spindle box. 8 spindle units are driven by the gears mounted in spindle box. Oil circulating device is provided for continuous and thoroughly lubricating specially developed fiber gears for smooth and long life. Other parts are made from highly graded materials to obtain higher efficiency and zero maintenance. 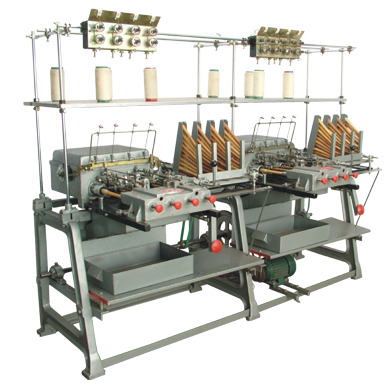 Being an automatic pirn winding machine, it is most ideal for winding synthetic polyethylene fiber yarn, cotton (10 counts to fine - superfine) filament yarn, Silk, Nylon terry line, terry cot and woolen yarn. Copyright © 2013 N-TEX (INDIA). All Rights Reserved.